Rebellions broke out across Europe during 1848, inspired by the success of the French in abolishing their monarchy in February. The Habsburgs faced rebellions in Hungary and in the Italian cities of Milan and Venice, which were supported by Piedmont. Although the revolutions in Italy, Germany and Hungary were all defeated, the liberal constitutions, unification and independence they were seeking did eventually come about. By 1848 many of the European countries were suffering from an economic crisis; the failure of the potato and grain crops in 1845-46 was reflected in the price of food. There was political discontent at different social levels: peasants demanded total abolition of the feudal system, industrial workers sought improvements in their working conditions, and middle-class professionals wanted increased political rights. In Italy and Germany there were growing movements for unification and independence. Revolutionary agitation began in Paris in February 1848, forcing the abdication of Louis Philippe and the establishment of the Second Republic. It then spread across central Europe. The Habsburg Empire, faced with demands for a separate Hungarian government, as well as demonstrations on the streets of Vienna, initially gave in to the demands of the Hungarian nationalists and granted them a separate constitution. This, however, was annulled some months later, leading to a declaration of independence by Hungary. The Austrian response was to quell the revolt in 1849 with the help of Russian forces. Discontent in Austria spilled over into the southern states of the German Confederation, and liberals in Berlin demanded a more constitutional government. As a result, the first National Parliament of the German Confederation was summoned in May 1848. In June 1848 struggles between the moderate and the radical republicans culminated in three days of rioting on the streets of Paris. In crushing the rioters the more conservative factions gained control, a trend that was repeated in Prussia, where royal power was reaffirmed. The second half of 1848 was marked by waves of reaction that spread from one city to another. 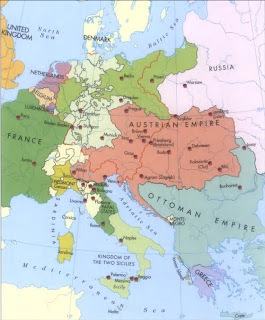 The restoration of Austrian control over Hungary was achieved partly by playing off against each other the different ethnic groups within the empire. However, despite the suppression of the 1848 revolutionaries, most of the reforms they had proposed were carried out in the second half of the century, and at least some of the nationalist movements were successful.